As with most misinformation, there is a mass of this issue online; some from experienced gunners and gun writers. 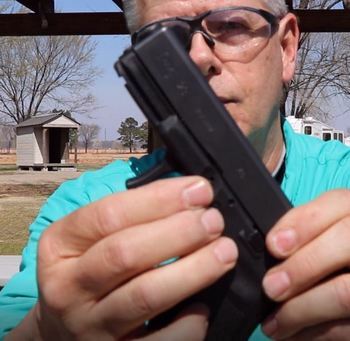 They maintain that you have to pull the trigger when disassembling a GLOCK pistol. Meaning, as you are removing the slide, the trigger must be pulled to get it to come off. Here's the reality. To remove the slide from a GLOCK during disassembly, the striker and trigger cannot be set to fire. In that condition, pulling the small removal lever on the side, and moving the slide back and forward will not remove it. For it to come off in that scenario the trigger must be pulled. where people are shot, and hands destroyed by carelessly performing that act. That scenario never needs to exist. Like you would when clearing your gun for anything you do. Watch the video to see exactly how it works, then read the rest. .....the slide is pulled back too far when trying to remove it. Too far meaning far enough to reset the striker and trigger. In that case, the slide will not come off without a pull of the trigger. No, the slide only needs to be pulled back about 1/8 of an inch while pulling down on the slide removal lever. That short movement does not reset the striker or trigger to ready to fire condition. Presto: Pull it forward and It comes right off without pulling the trigger. Then take the GLOCK apart. You never have to pull the trigger disassembling again.